Home News What Should I Bring to the Evergreen Conference? Are you planning the details for your trip to the Evergreen Conference? I know I am, so I thought I’d tell you a little about how I’m planning. Mental Prep: I watched a webinar to brush up on some networking/relationship building skills. I’m learning base level competencies and watching action in the Evergreen community so I can see where I can volunteer my skills to the open source group and match communication protocols. I read the conference schedule and am considering which classes to attend. I’m ready with an elevator speech for new people I meet and thought about some stories to share. I’m pumping up my energy and am ready to make in-person connections with PaILS membership and the greater open source community. I’m remembering the networking game and thinking about things I offer, things I need, and things that make me and my org interesting. I’m excited to meet you all; we share such important work. Arrange Household Care: For me its pets and my plants that need care, since my husband is attending the conference too. (He’s my biggest supporter, so now he’s Evergreen’s newest supporter too. He’s also a skilled technology wizard that is setting up the infrastructure for my home access experiments on 3.3.) Without confidence in a care plan for my pets, I could never leave home for longer than a few hours at a time. The struggle is real. It’s also garden season, I can’t let my vegetable babies dry out. To truly engage at a conference event, you have to trust good things are happening at home in your absence. My plan is in place. Plan for Your Absence from Work: How will staff handle your time away? Have you prepped the schedule and everyone? Are instructions written, or do you simply trust your awesome staff will use best judgement it in the moment? Will you use the Out of Office reply on your email? The Wardrobe: Dress code is my least favorite subject. I consider lots of factors in my plan and I’m known to overcomplicate sometimes. Weather: It’s late April, so unpredictable, and anyway we’ll be in a conference center, so self-adjusting with layers is key to success. Comfort: Yes, please. Style: I love color. Level: Who am I meeting? How will I choose to conform to social norms or be interesting? Dressing is easy for some, but sometimes it’s hard to decide. My clothes don’t tell a story of money spent, and usually have stray pet hairs on them–it’s unavoidable. I’ll aim for basic dresses, skirts, and comfy shoes with a pair of jeans or corduroys for more casual events. Authentically me–and I’m best when I feel confident. I have a lot of other things to pack, because PaILS/SPARK will have a booth at the conference. I’ve got banners and table covers and some pens and keychains with our brand. The booth may not be a constantly staffed place. We’ll have some materials and information out, as well as a flipchart easel as a place to create content around conference ideas. I will use the booth as a meet up spot. If we start a good conversation, I may say, “hey meet at the PaILS / SPARK booth at such and let’s brainstorm and record that idea.” I am planning to SPARK conversations and build relationships at the conference and I hope you are planning to too. 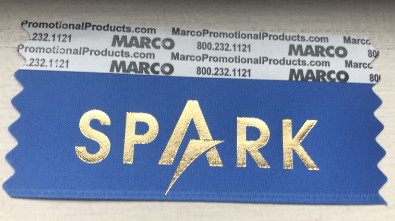 Bonus for PaILS member library staff: We had badge ribbons made so we will be able to identify each other at the conference. It’s a custom piece of flair. I believe we’ll be a able to hand them out at registration. Continue the conversation about how you are preparing for the conference… Comments are open here, or start a conversation on the mailing list. I’m excited–it’s approaching very quickly!